HAMDEN, Conn., May 18, 2018 – Seven Connecticut students (six projects) won awards at the 2018 at the prestigious Intel International Science & Engineering Fair(Intel ISEF), a program of Society for Science & the Public, held May 13-18 in Pittsburgh, Penn. 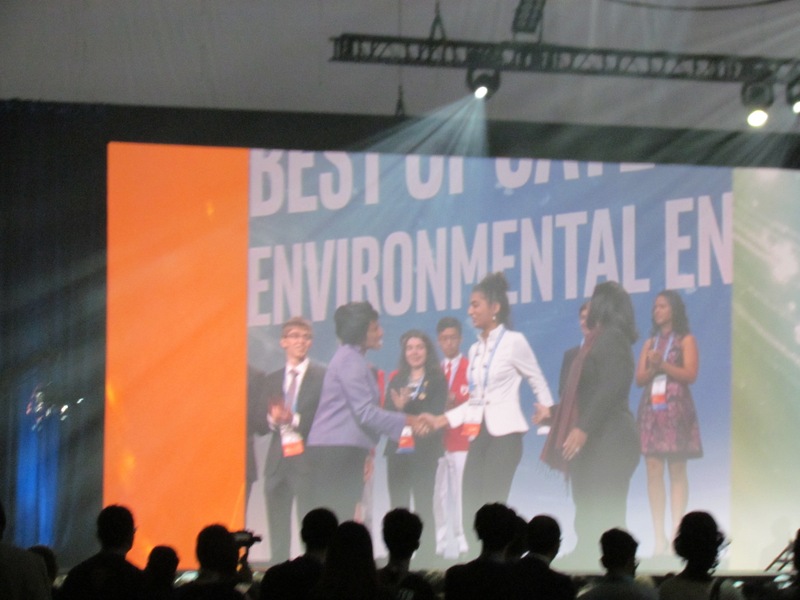 Intel ISEF is the world’s largest pre-college science and engineering fair. An eight student delegation attended ISEF all-expenses paid as part of their prize for earning top awards at the 2018 Connecticut Science & Engineering Fair (CSEF). The eight CSEF winners were among 1,800 competitors from over 75 countries, regions, and territories competing at ISEF for over $4 million in prizes. In addition to competing and earning thousands in prizes and scholarships, the young engineers and scientists attended scientific panels, networking events, met fellow students from all over the world, and made many memories during their week in Pittsburgh. 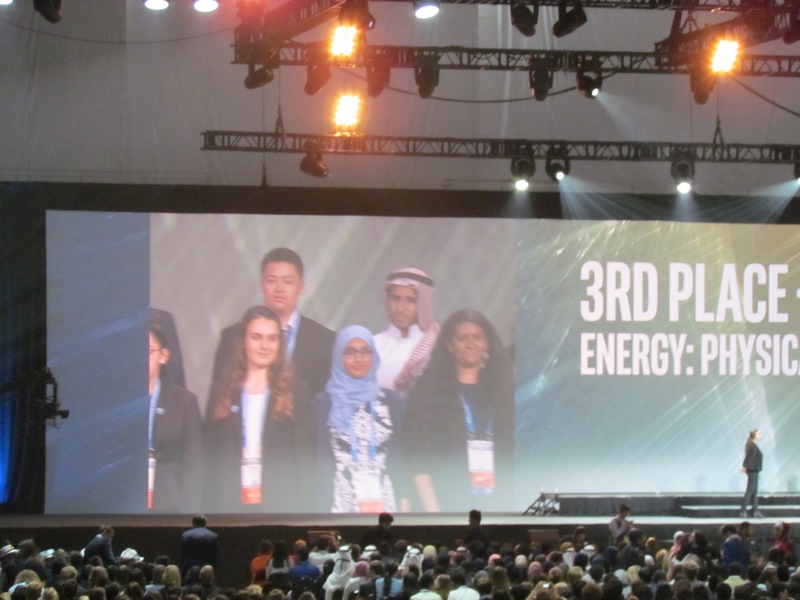 The 2018 Intel ISEF Special and Grand Award Ceremonies were held on May 17 and 18, respectively. Raina Jain, Greenwich High School, Greenwich. Category: Environmental Engineering, INTEL Best of Category Award–$5,000 cash award and First Place–$3,000 cash award. At the Special Awards ceremony, Jain received a second place award and a $1,000 cash prize from the Spectroscopy Society of Pittsburgh. Maya Geradi, Wilbur Cross High School, New Haven. Category: Chemistry, Third Place—$1,000 cash award. Geradi also received an Honorable Mention award from the American Chemical Society. Hiba Hussain, Greenwich High School, Greenwich. Category: Biomedical Engineering, Third Place—$1,000 cash award. Shobhita Sundaram, Greenwich High School, Greenwich. Category: Translational Medical Science, Third Place—$1,000 cash award. During the Special Awards ceremony, Sundaram received a Research in Medicine award and a $1,000 cash prize from King Abdul-Aziz and his Companions Foundation for Giftedness and Creativity. Keshav Vedula, CREC Academy of Aerospace & Engineering High School, Windsor. Category: Engineering Mechanics, Third Place—$1,000 cash award. During the Special Awards ceremony, Vedula received a second place award from the Arconic Foundation ($1,500 cash award) and third place ($1,000 cash award) from the American Institute of Aeronautics and Astronautics. Srikar Godilla and Cristian Rodriguez, CREC Academy of Aerospace & Engineering High School, Windsor. Category: Materials Science, Fourth Award—$500 cash award. At the Special Awards ceremony, Godilla and Rodriguez were recognized with a first place award and $2,500 cash prize from the Society for Experimental Mechanics, Inc.
About the Connecticut Science & Engineering Fair: The Connecticut Science & Engineering Fair is a yearly, statewide science and engineering fair open to all students in grades 7-12 residing, or enrolled, in Connecticut and Fishers Island schools. The primary objective of the fair is to attract young people to careers in mathematics, science, and engineering while developing critical thinking and public speaking skills. Through their participation in the fair, students are encouraged to pursue independent work using proper research methods. The fair is supported by academic and industrial organizations through the state. The non-profit Connecticut Science & Engineering Fair is a volunteer organization fund that directs funds toward student awards, educational presentations, fair operations, and workshops. For more information, visit: www.ctsciencefair.org.